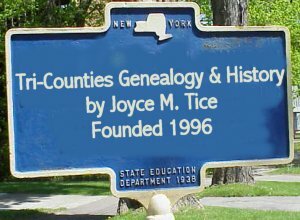 Joyce M. Tice scanned it and formatted the page. 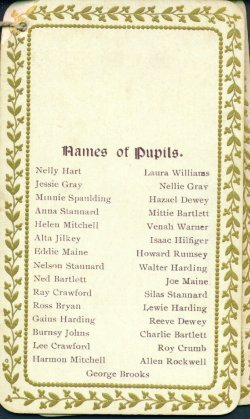 Text: Diantha Ashley was teacher at the Maineburg school in the village of Mainesburg for the 1919-1920 term. It was a graded school, and she apparently taught the younger class - 5 to 9 year olds. 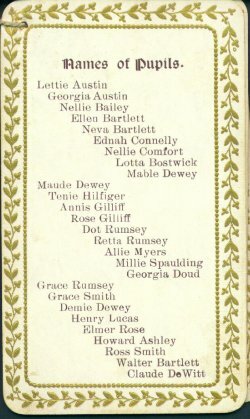 Participants: The following individuals are linked to this event: Gladys Cleveland* (Student); Evelyn Cleveland* (Student); Mildred K. Dewey (Student); Hilda M. Every (Student); Grace Marion Scott (Student); Helen Tanner (Student); William Jasper Scott (Student); Freeman R. Shaw (Student); Merritt Eugene Scott (Student); Harold Chamberlain (Student); Francis T. Aumick (Student); Laurence George DeWitt (Student); Frederick H. Hagar (Student); Ernest Neil Hilfiger (Student); Richard G. Hilfiger (Student); Diantha Louiza Ashley (teacher). 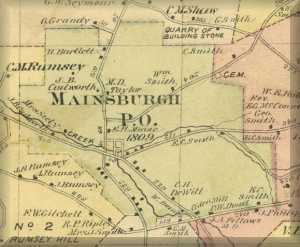 Text: Diantha Ashley was teacher at the Maineburg school in the village of Mainesburg for the 1920-1921 term. 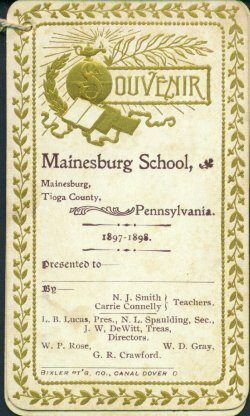 It was a graded school, and she apparently taught the younger class - 5 to 9 year olds. Participants: The following individuals are linked to this event: Gertrude A. Smith (Student); Eleanor Cady (Student); James Reynolds (Student); Glenn H. Tanner (Student); Bessie Brown* (Student); Marletta Joy Stauffer (Student); Arana Hillimire* (Student); Francis T. Aumick (Student); Lawrence E. Chamberlain (Student); Helen Tanner (Student); Frederick H. Hagar (Student); Hilda M. Every (Student); Ernest Neil Hilfiger (Student); Richard G. Hilfiger (Student); Freeman R. Shaw (Student); Diantha Louiza Ashley (teacher).